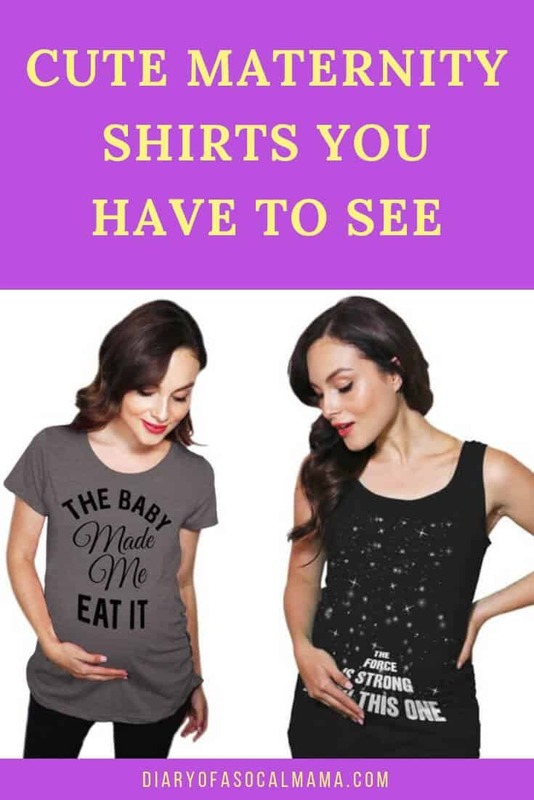 It’s time to rock your baby bump with some fun maternity shirts. Don’t try to hide, wear it proudly with one of these sweet or funny t shirts. Just make sure to get a big enough size for your growing bump. A shirt can be a fun way to make a statement or announce your pregnancy. Whether you’re a first-time mom or a seasoned pro there’s a shirt for you. 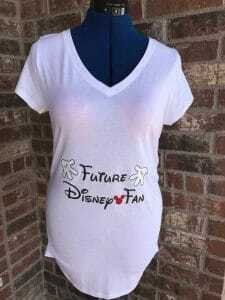 I’m especially a fan of Disney maternity shirts. All of these are available on Etsy so you’re supporting a small business too. Check out these cute ideas for maternity shirts! 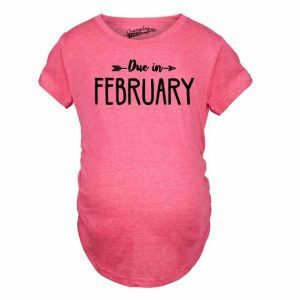 A due date shirt is a must-have in your pregnancy wardrobe! Ones like this Due in February shirt are simple but fun. I picked February since that’s when I’m due, but they have other months as well. First time mom? How about this fun Mama in the Making. 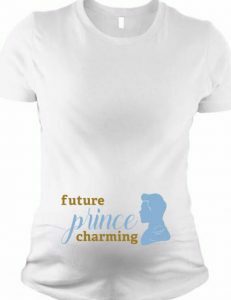 Great for a pregnancy announcement shirt or everyday wear. Dinosaurs are all the rage these days. 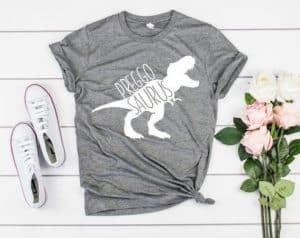 This Preggosaurus shirt is too cute to pass up! Are you a Star Wars fan? 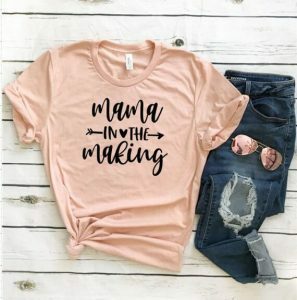 Then this is the perfect maternity shirt for you! You already know the force is strong with your little one. 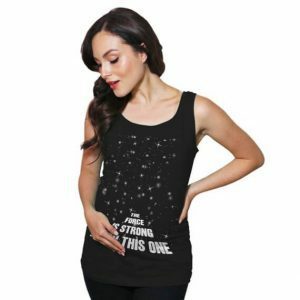 Looking for funny maternity t shirts? These are great for a laugh, conversation starters, or to make a point. 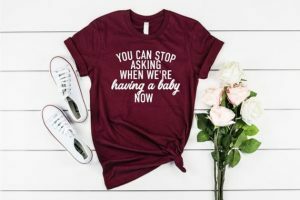 Use this funny shirt when announcing to those relatives who constantly asked when you were having a baby! If you’re like me you hate people who think they get a free pass to touch you just because you have a bump. 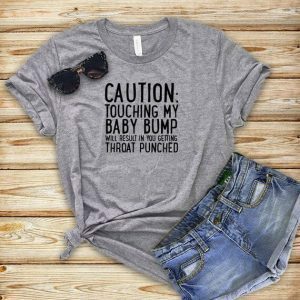 Let them know to keep their hands to themselves with this funny maternity tee. One of the many things you have to give up while being pregnant is beer! I don’t drink much when not pregnant, but even I miss having a drink from time to time. 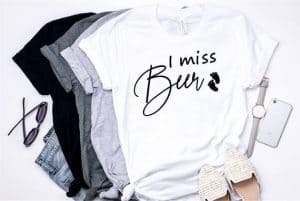 Wear this fun I Miss Beer shirt when your friends invite you out to the bar! Everyone knows that pregnancy can make you crave some pretty crazy things. 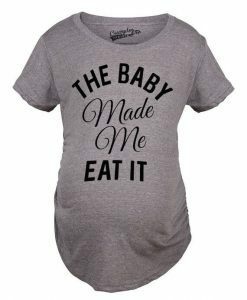 Go ahead and blame it on the baby with this funny shirt that says “The baby made me eat it“! Who doesn’t love Disney?! 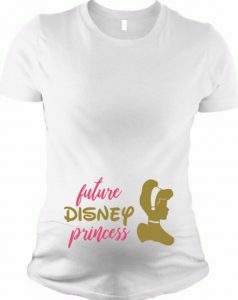 Have some fun with these sweet Disney maternity shirts. I picked up a couple for a recent trip to Disneyland! Are you a beauty and the best fan like me? 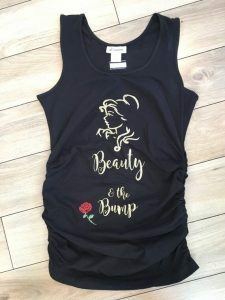 Then grab this fun Beauty and the Bump maternity shirt. Buy this one size larger than you need so it will last longer. You know you’re going to turn them into a Disney fan when they’re on the outside. There’s a good chance at least part of your pregnancy will be in the fall. 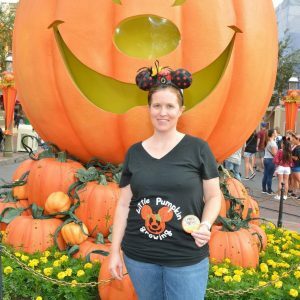 This Little pumpkin tee was perfect for my fall trip to Disney and I plan to wear it for as long as I can. And one for the future Prince as well! While much of pregnancy is focused on preparing for the baby ahead don’t forget to treat yourself to something fun. Check out these other must have pregnancy items. These are cute! I used “The force is strong with this one” to announce my last pregnancy with my baby boy! My mom got off a plane and read my shirt and almost fell over!